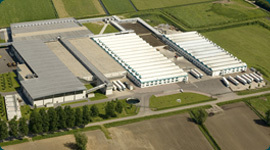 The service offered by Hooymans Compost B.V. is an essential part of the production process. The appropriate compositions of raw materials for the compost and the circumstances at the grower are of influence to the quality of the finished product. Therefore Hooymans Compost BV guarantees an excellent service from the beginning to the end of the production, especially regarding the field of cultivation guidance.